This week another Central American country left Kingston in high spirits, after qualifying for FIFA’s 2014 World Cup. 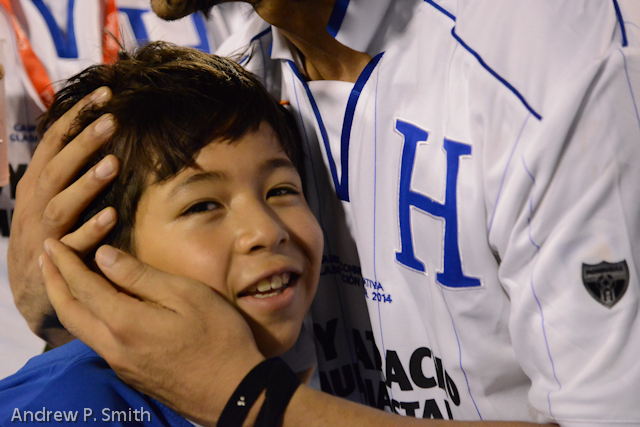 A young Honduran supporter is hugged by a member of the national football team during celebrations for qualifying for the 2014 FIFA World Cup in Brazil after drawing with Jamaica 2-2 in Kingston. On Tuesday Honduras’ men’s national football team followed in the footsteps of their Costa Rican counterparts by coming to Jamaica’s national stadium and leaving en route for Rio. This was a result of their 2-2 draw with the home side in the final match of the CONCACAF hexagonal round, which saw Honduras qualify as the third team with fifteen points behind the United States and Costa Rica. Jamaica finished their campaign with five points from their ten matches, with five draws and five loses which resulted them dropping four positions down the FIFA rankings to 82nd. Here are scenes from the match. 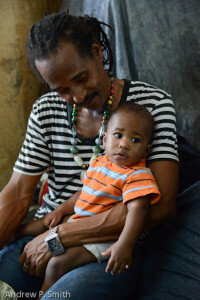 Papine in eastern St. Andrew is the last settlement that you will pass through when you leave Kingston and head into the foothills of the Blue Mountains. It is a historical community, being the location of the Papine sugar estate that was founded in the mid eighteenth century. The main remnant from this era is the aqueduct which carried water from the Hope River to irrigate the Hope, Papine and Mona sugar estates. Now, most people think of Papine as either the bus terminus or as the location of the Papine market. As such, it is a hub of activity – of pedestrians, vehicles and vendors. 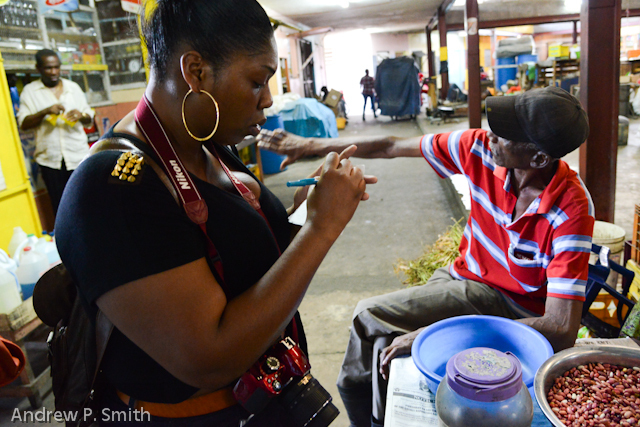 One of my photojournalism students in Papine market. Papine is also being touted as a potential “university town”, due to its history and close proximity of both UTech and the University of the West Indies (UWI) Mona campus. For this to happen, a lot of work needs to take place. For example, UTech students confirm that while they do have lunch at the various eating places, student-friendly hang-out spots are absent. 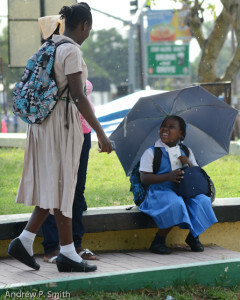 My most indelible memories of Papine are as a high school student walking from Jamaica College to catch a bus. Ideally, we could have just waited by the bus stop outside the school, but most of the buses sped past, refusing to stop for the “Boys in Blue”. And honestly, sometimes we just felt like walking. Decades later and now I work in Papine at the University of Technology, Jamaica (UTech). I find it is a great location to take my photojournalism students for them to be experienced and comfortable with street photography, approaching and photographing strangers and general documentation of locations. While overseeing my students I occasionally manage to grab a few shots myself, of which here are a few. 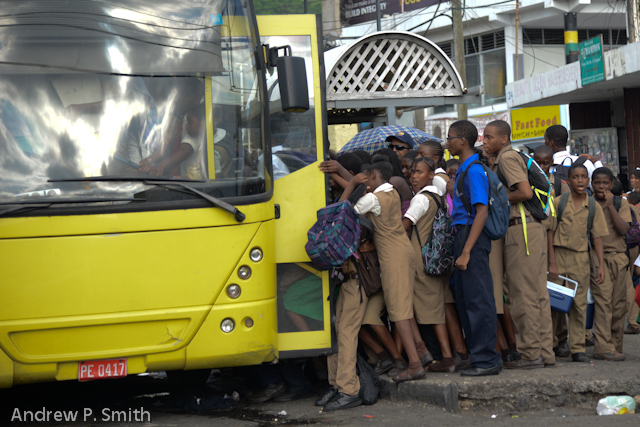 And as you can see the boys in blue still stand out from the crowd when they are catching the buses in in Papine.